This was supposed to be the Monday print column. For unknown (to me) reasons, it didn't run. Since it's pegged to this afternoon's opener, I'm posting it now. Opening Day is supposed to be about fresh beginnings and the promise of the new season. The Twins spent the offseason reinforcing a weak starting rotation. Terry Ryan and Co. did a pretty good job of it. Ricky Nolasco, Phil Hughes and the returning Mike Pelfrey aren't likely to win any Cy Young awards, but the rotation won't be the burden it has been the past two years. But the offense is ... offensive. The 2013 Twins scored 614 runs. That was Minnesota's lowest full-season total since 1972, a year when hitting was so low the American League adopted the designated hitter rule. The Twins' lineup repairs: Replacing Ryan Doumit and Justin Morneau with Kurt Suzuki and Jason Kubel. That's not enough. The 2014 Twins will struggle to score runs again. It really doesn't matter what batting order Ron Gardenhire deploys; he can only hit Joe Mauer in one place in a game, and most of the remaining slots will inevitably be filled by guys who should be hitting eighth or ninth if they belong in a major league lineup at all. In fairness to the Twins' brain trust, I don't think they intended their position-player moves to be largely recycling guys who were good five years ago. In the words of assistant general manager Rob Antony, "We were trying to give money away." The good veteran free agents went where they might win immediately; other free agents, to be blunt, would only be in the way. What I'll look for in 2014 from this team isn't contention. It's progress. Suzuki, Kubel, Josh Willingham, Pedro Florimon, Correia, Jarod Burton, Jason Bartlett ... they are all essentially irrelevancies. None of them will be part of the next good Twins team. Probably the best thing the front office did this winter was not get themselves into a position in which the irrelevant players are in the way of the relevant ones. Edward Thoma (344-6377; ethoma@mankatofreepress.com) maintains his Baseball Outsider blog at fpbaseballoutsider.blogspot.com. Follow him on Twitter @bboutsider. The Twins weren't just settling the major league roster late last week and into this week. They have four minor league teams starting play this week as well: Triple A Rochester, Double A New Britain, High A Fort Myers and Low A Cedar Rapids. As of Sunday evening, the Rochester Red Wings website and the Cedar Rapids Kernels site appeared to have updated, accurate rosters -- at least rosters that made sense. The New Britain roster was far from complete, and the Fort Myers one appeared to have last year's pitching staff listed. I was poking around the roster because Scott Diamond accepted his assignment to Rochester on Saturday rather than declare free agency, and I was thinking about how he might be used. We can count on this: Alex Meyer and Trevor May are going to be in the Red Wings rotation. At least one beat writer said Diamond and Kris Johnson are the primary candidates should a starter be needed in the early going. (Johnson is on the 40-man roster and Diamond is not, but with two openings on the 40 at the moment, that's not a serious impediment to bringing Diamond back.) Presumably, then, those two will also be in the rotation. That leaves one starting slot, and the Wings' roster includes lefties Logan Darnell and Brooks Raley, who have been starters for the bulk of their minor league travels. Or ... we've heard a lot of chatter from the Twins broadcasters about the idea of returning Ryan Pressly to starting. I'm not particularly big on that notion; Pressly was nothing special as a starter in the Red Sox system and really only became a noteworthy prospect when he moved to the bullpen. But even if the Twins aren't seriously thinking about Pressly as a big league starter, they may well figure that he has a better chance of helping the big league team in the future than either of the lefties (I think that's the case), and therefore they should funnel the innings in Pressly's direction. The Red Wings appear to have a very deep staff, deep enough to make me wonder what they would have done had Andrew Albers not chosen to play in Korea. Of course, had Albers remained in the organization, they might not have claimed Raley on waivers just before camp opened. as Prince Fielder of Texas tags out Nick Swisher of Cleveland. I guess it's spring training for the umpires too. Or it has been. Time for the real deal. It didn't help his pitching. Scott Diamond didn't make the Twins rotation. Since the lefty is out of options, the Twins put him on waivers, and 29 teams passed. They said, in effect, that he can't make their rotations either. Diamond has until midday today to decline to report to Triple A Rochester and declare free agency, but my guess is that he's not going to find a major league job elsewhere. But I'm also not sure how he fits into the Twins future either. It's a similar situation as with Vance Worley when the Twins pulled the plug on him The Rochester rotation has five guys, maybe six, without him, and there's a case to be made that all should rate ahead of Diamond. I'm an unabashed Diamond fan, for a variety of reasons, not least of which is that I grew up in an era when several ground-ball lefties thrived without velocity. Tommy John. Scott McGregor. Geoff Zahn of the Twins. But the game has changed. In the second decade of the 21st Century, pitchers have to be able to miss bats. The lineups are deeper, the hitters more powerful than 40 to 30 years ago. And Diamond has trouble generating swings-and-misses, not to mention strikeouts. For Diamond to be effective, he has to be top-of-the-charts in ground ball rate and control. Not merely better than average, but best or nearly best in the league. He was in 2012; he wasn't in 2013. And this spring, Diamond walked 10 men in 17 innings. That won't do. Jason Bartlett can handle center field. The Twins made three serious cuts Thursday. There's still one more to come — extra catcher Dan Rohlfing remains in camp — and the very real possibility that they'll pick up somebody on waivers, but they've essentially pared down to the Opening Day roster. And what an odd bench this figures to be. 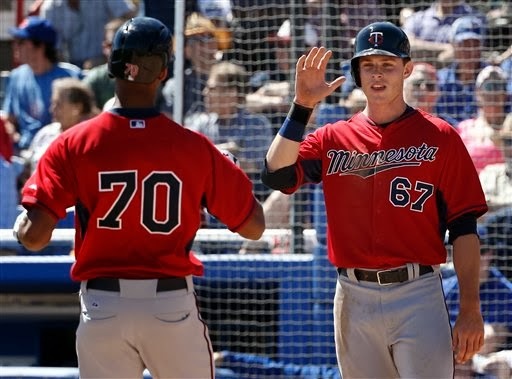 The Twins lost outfielder Alex Presley on waivers to the Houston Astros. They also saw first baseman-outfielder Chris Parmelee and left-handed pitcher Scott Diamond clear waivers. The resulting bench: catcher Josmil Pinto; first baseman Chris Colabello; infielder Eduardo Escobar; and infielder Jason Bartlett. There is no true fourth outfielder there. There are two shortstops, in Escobar and Bartlett, who are supposed to be "super utility men," although there's no real reason to believe either can hit enough to play. There are two right-handed bats of limited defensive value in Pinto and Colabello. Is there a purpose to having a bench player who fits the traditional fourth outfielder role? Considering the extreme defensive limitations of the trio who figure to get the bulk of the playing time in the outfield corners (Josh Willingham, Oswaldo Arcia and Jason Kubel), having somebody who can pinch run and then track down a fly ball late in games might be handy. The idea seems to be that Bartlett and Escobar can handle those chores. I know that Bartlett made a catch in center (photo above) earlier this month that drew a lot of comment at the time, with manager Ron Gardenhire sounding impressed, but I'm less than completely sold. What I call The Cuddyer Principle holds that any right-handed major leaguer can at least pass at any non-battery position for a while without it being painfully obvious that he doesn't belong there. Gardenhire, I think, is proposing The Bartlett Corollary to The Cuddyer Principle: If you can play shortstop in the majors, you can play any position well. We'll see if Gardy actually uses one of those extra shortstops as a defensive sub in left or right. Another thing to watch for is if Colabello has a role other than pinch-hitting. 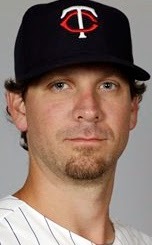 Gardenhire is platoon-adverse, but Kubel has never really hit left-handed pitching and is hardly likely to start now. Colabello makes the most sense on the roster as a DH against lefties. The Twins will face one of the league's tougher lefties, Chris Sale, in the opener Monday in Chicago. Colabello should be in the lineup — and Kubel on the bench — against Sale. But that's exactly the kind of matchup move Gardenhire has habitually avoided. Benches are, of course, made up of flawed players. Nobody's so deep that a Willie Mays winds up as the fourth outfielder or Derek Jeter as a utility infielder. I didn't expect the Twins to cut Presley or Parmelee, much less both, but in the abstract, I don't quarrel with either move; neither player figures to be a great loss. The real issue is that the regular lineup figures to be so flawed, that there's plenty of room for aggressive bench use. Is this a bench Gardenhire will use? Given Gardenhire's established preferences, I'm not sure there IS a bench he'll use. 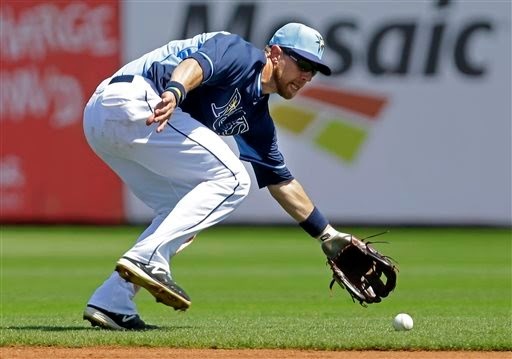 What the Twins don't get about the Rays' "interchangability"
Ben Zobrist plays all over the field for Tampa Bay. order, so he's not a bench player. Ron Gardenhire on Sunday apparently talked a great deal about wanting a bench of "interchangable" multi-position players, and cited the Tampa Bay Rays as a model. The Rays do have a number of players who play all over. Ben Zobrist, for example, has started games at every position except pitcher and catcher in his eight years with Tampa Bay. Last year Zobrist started 117 games at second base, 26 in right field and 11 at shortstop — and switched positions multiple times mid game. Sean Rodriguez is another Swiss utility knife of a player: In 2013, he started 30 games in left field, 17 at first base, five in right, three at short, one at second. In 2012, it was 42 at short, 27 at third, 17 at second. Rodriguez, like Zobrist, has started games at seven different positions for the Rays (four seasons). But the thing is: These guys play. Zobrist gets more than 600 plate appearances a season. Rodriguez is more of a bench guy, but he averages well over 100 games a year. Zobrist has made two All-Star teams and been on Team USA for the World Baseball Classic. His versatility may be his calling card, but what makes his versatility valuable is that he hits enough to be in the lineup — and not only that, but in the top half of the lineup. Rodriguez isn't as good a hitter, but he does enough at the plate to play at least half the time. The thing is, Escobar won't be in the starting lineup at any of his multiple positions on March 31. Zobrist will, and Rodriguez might. Gardenhire's desire for interchangeable parts is as a security blanket for injuries; his benches are generally guys waiting for somebody in the lineup to get hurt. Joe Maddon, Gardenhire's Tampa Bay counterpart, is looking for matchup advantages. Maddon uses the versatility of Zobrist (a switch-hitter) and Rodriguez (right-handed hitter) to enable complex, multi-level platoons, much as Casey Stengel did with the Yankees of the 1950s. I don't think any of Gardy's potential "interchangable parts" hit well enough to fit the Maddon model. The Twins sold Vance Worley to Pittsburgh on Tuesday. It's no surprise that they moved him out of the organization; as I've written a few times, he didn't fit in the Triple A rotation. Even if, as it now appears, Kyle Gibson isn't going to be optioned out again, Rochester has Alex Meyer, Trevor May, Sean Gilmartin, Kris Johnson and Logan Darnell, all of whom figured to be ahead of Worley. The Twins didn't get much from Worley, but that doesn't mean the Ben Revere trade was a disaster. May remains, and he was always the higher ceiling piece of the deal. And Revere remains what he was when the Twins traded him, a player of extreme strengths and weaknesses. He should be a usable major leaguer for years; I don't expect him to become a star. Certainly the Twins expected more than they got from Worley, and certainly the trade would look better had they gotten some decent pitching from him. I don't think his failure means the Twins should regret the trade. 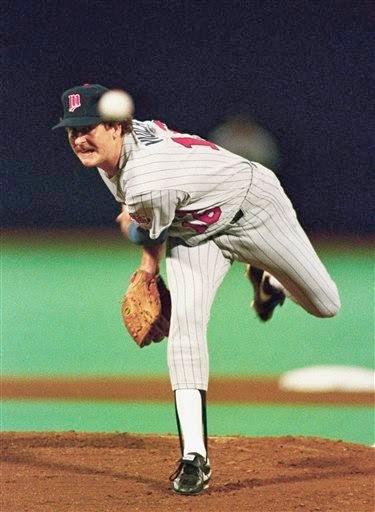 Frank Viola, one of my faves from the the 1980s Twins, needs heart surgery. It will come next week, and it will keep the 1988 Cy Young Award winner from serving as the pitching coach for the Mets' Triple A affiliate in Las Vegas. Good luck to him. ... when he says that he’ll swing less in the strike zone this year, he’s talking about really swinging at the pitches he wants to make contact on. In other words, he’d like to be “more in that (Joe) Mauer category, really efficient, swinging at a really low rate inside the strike zone, and outside the strike zone, very rarely swinging.” Nobody swings less than Joe Mauer. Votto, like Mauer, takes a lot of heat from the local radio ignoramuses who confuse RBIs with productivity. Matt Guerrier did re-up with the Twins. While he lost out on his retention bonus, he did get an earlier opt-out date, so he got something out of it. The Twins on Monday optioned out, reassigned or released 10 players. This was the really serious round of cuts, the ones that truly shape the Opening Day roster. Pitchers: Non-roster relief candidates Deolis Guerra, Matt Hoffman and Aaron Thompson were reassigned, and 40-man roster relievers Michael Tonkin and Ryan Pressly were optioned out. Nonroster reliever Matt Guerrier was released. Guerrier might be back, and I think he will. Had the Twins simply reassigned him to Rochester — and they could have — they would have owed him a retention bonus. Guerrier figures to see if anybody else was impressed enough to offer him a major league job; if not, he's likely to re-sign and go to Rochester. Pressly was in the bullpen all last season, but he was a Rule 5 guy then. Those restrictions no longer apply, and he and Tonkin simply ran afoul of the numbers. I saw tweets from a couple of metro writers surprised that Tonkin didn't make the roster, but he needed one of the established right-handed short men (Jared Burton, Casey Fien) to be traded or hurt. Still does, for that matter. Guerra, Hoffman and Thompson were always destined for Rochester. Hitters: Nonroster infielders Doug Bernier and Delbinson Romero were reassigned, as was nonroster outfielder Wilkin Ramirez. No real surprises there. 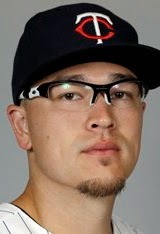 Catcher-outfielder Chris Herrmann, who is on the 40-man roster, was optioned out, and after Ron Gardenhire went out of his way on Sunday to rave about Herrmann, that was a surprise. It appears the Twins will keep Chris Parmelee, who is out of options, instead. The problem is that it means little DH time for Josmil Pinto, and that probably means the Twins will be using a lefty at DH or in the outfield against left-handed starters. Gardenhire has never paid a lot of attention to the platoon advantage, of course, but after the weekend hint that he was open to it, this is disappointing. What's left: The Twins now have 29 players in camp, four more than they can take north. One cut is obvious: Nonroster catcher Dan Rohlfing's not making the final roster. He's just around to ease the strain on Kurt Suzuki and Pinto for the final week of exhibitions. Kyle Gibson and Scott Diamond are duking it out today for the fifth starter job. Gibson has an option left, Diamond does not. The Twins might opt to keep both and option Caleb Theilbar out. One of Parmelee or Chris Colabello stays, and Colabello has options left. The utility infield job goes to either Eduardo Escobar or Jason Bartlett, and as much as Gardenhire raves about Bartlett, Escobar should be an easy choice. Maybe Bartlett will agree to go to Rochester. If he doesn't, I don't think the Twins are losing out on much. There was a fake report Sunday night that Vance Worley had been returned to the Phillies. I suppose part of the reason it got some play on Twitter is that it's believable, even expected in some circles; the Phillies need pitching depth, the Twins have no obvious role for him at Rochester, and the Vanimal had some success with them. Whether there's interest elsewhere in Worley, the Twins have some serious roster moves ahead, and probably some will come today. When Worley cleared waivers last week and was outrighted to Triple A, the Twins were down to 39 players in camp (and, coincidentally, 39 players on the 40-man roster). That's 14 too many for the Opening Day roster. The word Sunday was that Ron Gardenhire had hinted at keeping Chris Herrmann on the Opening Day roster for his versatility — and, presumably, because having three catchers would allow heavier use of Josmil Pinto as a DH, perhaps in a platoon role with Jason Kubel. Gardenhire's platoons have been few and far between, so at least until he specifically says that's the plan I'm not counting on it. Either way, it's not looking good for Chris Colabello or, in particular, Chris Parmelee, who (unlike Colabello) is out of options. UPDATE: Scratch all that Herrmann stuff. He was one of 10 cuts this morning. Too bad. as little leaguers toss balls into the air at Bondi Beach in Sydney. The 2014 regular season officially opened this weekend -- a silly two-game series in Australia between the Los Angeles Dodgers and the Arizona Diamondbacks. This isn't so much about growing baseball in Australia as it is about marketing MLB in Australia. Baseball may not be the biggest sport Down Under, and it may never be the biggest sport there, but it is well established and growing. The Twins have signed a number of players from there, and so far they've not had a lot of impact on the Twins (Grant Balfour didn't get his career going until several years after the Twins cut him loose). But they have high hopes for Lewis Thorpe, a teen-aged left-handed pitcher who tore up the GCL last summer. Playing these two games in Sydney isn't necessary to make the game popular there. And it is oddly disruptive; these teams will now have to return to the other side of the planet and pick up afresh a week later. in the Minnesota starting rotation. When the Twins on Friday morning listed the planned starters for the next five exhibitions, the beat writers concluded that the braintrust had settled on a rotation: Ricky Nolasco, Kevin Correia, Phil Hughes, Mike Pelfrey and Kyle Gibson. Not so fast, the Twins quickly said. It's still not settled between Gibson and Scott Diamond. I'm a Diamond fan, but Gibson needs to be in the rotation. The 2009 first-round pick is 26 years old. It's time to find out what the Twins have in him. Right now, Nolasco is clearly the best starting pitcher in the Minnesota rotation. To be a true contender, the Twins need at least two starters better than his established level of performance. Gibson might be one of those starters. What I would really like is for the Twins to trade away Correia to open a rotation spot for either Deduno or Diamond. Reportedly there have been numerous scouts at the Twins games, raising speculation that deals could be in the works involving some of the out-of-options starters or bullpen arms. My guess, however, is that no deal is coming, and if one does happen before the opener, trading away a veteran reliever is more likely than trading a starter. Keeping one of the starter candidates (Deduno) as a reliever is a bad sign for Ryan Pressly and Caleb Thielbar, two of the seven holdovers from 2013's relief corps. Presumably the Twins will open with a seven-man bullpen, so somebody loses out to make room Deduno. If Michael Tonkin makes the squad (and he should), that's another spot taken from an incumbent. That's why a bullpen trade seems plausible. When the Twins drafted a high school catcher named Brian Navarreto in the sixth round last June, I looked at the name and figured: Italian. Nope. Black kid. Big (listed at 6-3, 220) and said by Baseball America to have the best power bat among the Twins draftees last summer — which isn't all that impressive, as the Twins spent most of their high picks on pitchers. Still, Seth Stohs was telling me about a massive shot Navarreto hit that was ruled foul. Tom Kelly said, according to Seth, "That was too long anyway." I watched Navarreto catch a couple of bullpen sessions. Presumably he's a bit raw behind the dish, but he seemed to move well. He was working with the Cedar Rapids crew, but the catching assignments are particularly fluid; the most likely catchers in Triple A were still in the major league camp at that point, so there will be a downward flow of backstops as the Twins pare the numbers. Navarreto spent last summer with the Twins GCL team, at the bottom of the ladder, and is probably more likely to be in Elizabethton than in CR this year. Tyler Grimes caught in CR last year. It was his third season in the Midwest League. But the first two were as a shortstop. Last year the Twins switched him to catcher, and he hit a little better overall than he had as an infielder. He was drafted out of college, so it's not like he's got lots of time to dawdle in the low minors. I thought he looked pretty good behind the plate in the limited time I saw him last summer, and I rather expected him to be one of the extra catchers invited to major league camp this spring. Presumably he'll finally step up the ladder a notch to Fort Myers this year. By the end of last season, he was getting some infield time again, and I saw him playing third base in a game last week, so maybe he's ticketed for a multi-use role. Or maybe he's on his way out the door. One of the four non-roster catchers early in big league camp was Stuart Turner, the Twins' third-rounder last June. Turner draws raves for his defensive tools, but there's less certainty about his bat. Turner spent last summer in Elizabethton, with one game in Double A (skipping two levels). I expect him to go to Cedar Rapids, where he figures to be handling a staff of great importance to the Twins future. The Twins drafted Dereck Rodriguez in the sixth round of the 2011 draft as an outfielder. The son of the catching great Pudge Rodriguez hasn't hit in three years of Rookie ball, so now he's converting to pitching. I didn't see him throw. He's 21 now, and I wonder where they'll send him. Probably E-town again (where he played last year), but 21 is fairly old for the Appy League. But he's new to mound work, at least as a pro, and the Midwest League is probably too much of a reach for him. an infield drill with the High A squad of the moment. Disclaimer: This is far from a real-time report. I spent three mornings last week / early this week wandering around the minor league fields watching, photographing and thinking about the Twins prospects and the process of turning them into (in some cases) major league players. Only now am I getting around to writing about it. There's a color code to the minor league side. The players wear gray uniform pants and navy shirts with red numbers and their name on the back. The managers, coaches and instructors wear the home white pinstriped uniforms; Doug Mientkiewicz wears his old 16, even though on the major league side that's Josh Willingham, and Tommy Watkins wears the 61 he had during his one cup of coffee, even though that's now Jared Burton on the big team. Big league players sent over for some action on the back fields wear the navy and gray, but with a slight difference: The numerals are white, and there's no name on the back. This all makes the authority figures easily recognizable. A novice in camp may not know Jeff Smith (Double A manager) from Gary Lucas (High A pitching coach), but he knows if a guy in white tells him to run a lap, he's running a lap. The one exception to this: Tom Kelly. The former manager wears the major league version of the navy jersey, and he floats from field to field, dodging fans and materializing next to whoever is running the drills on a particular field, leaning on his fungo bat and taking everything in, then moving on to another field. And then he'll take a handful of infielders to the half field and start hitting grounders and critiquing their glove work. Levi Michael, the Twins' first round pick in 2011, has had a difficult time of it in pro ball so far. The college infielder debuted in High A ball in 2012 and hasn't budged. Last year he hit a disappointing .229/.331/.340 at Fort Myers. When I saw him, all he was doing was trotting at half speed (if that) during warmup exercises. Apparently he'd injured his hamstring just before I arrived in town. Jorge Polanco is on the 40-man roster and was in major league camp but was one of the earliest cuts. No surprise; the Dominican infielder is still only 20 and spent last year in Low A. The general consensus is that he's a second baseman, but every time I saw him working in the field he was at shortstop. Sam Perlozzo, the former Baltimore Orioles manager who inherited Paul Molitor's role as a baserunning and infield instructor, seems to have Polanco as a special project. Perlozzo at one point had Polanco and fellow Dominican infielder Aderlin Mejia on a half field working on double play pivots, with Polanco at short and Mejia at second. Polanco has some promise as a hitter -- very good walk-strikeout rates, strong batting averages and enough pop for a middle infielder -- but I wonder if the Twins might be trying too hard on the shortstop thing. On the other hand, it seem universal: Any shortstop who is a plus at the plate at some point is "accused" of not being adept enough defensively. I tended to gravitate to the bullpen sessions. At one point J.O. Berrios took the mound, with Bo Altobelli handling the catching chores. Altobelli finished last season with Cedar Rapids, and Berrios spent the full season there. But when Berrios snapped off a breaking ball early in the session, it seemed to startle the catcher. He lunged right, gloved the ball and muttered, "oh, wow." Alex Meyer throws in the bullpen. Alex Meyer, the top pitching prospect in the organization, threw a few balls from the mound in a very light session. Still, it wasn't difficult to see that he has imposing stuff. Ryan Eades, last summer's second round pick, had been restricted from throwing. but kept trying to sneak onto the mound. Ivan Arteaga, who'll be the pitching coach at Cedar Rapids this year, kept chasing him off, but Eades did get a few throws in. Travis Harrison, a third baseman so far in his career, is apparently now ticketed for the outfield. Off what I saw in a few games at Cedar Rapids, that makes sense. He didn't show much on defense at the hot corner. Alex Wimmers walks down "Mount Perry"
after running up its steepest slope. 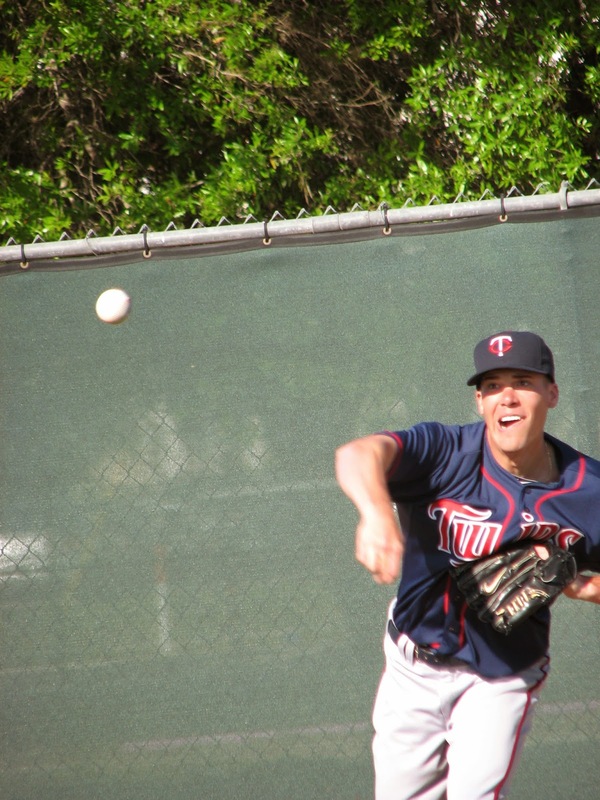 Alex Wimmers, the Twins first round pick in 2010, has just 77.1 professional innings so far. All I saw from him was some workouts on "Mount Perry," the new exercise hill, but the word was that he was healthy (for once) and displaying the plus changeup that made him a first-rounder. I'm not counting on him, and I doubt the Twins are either, but it would be nice to have something go right with him for once. I saw B.J. Hermsen, the organization's pitcher of the year in 2012, pitch for the Double A team against the Triple A team (and Pedro Florimon, visiting from the major league side as he tested his abdomen after his appendectomy). Hermsen did not fare well at all. In 2012, Hermsen went 11-6, 3.22 in 130 innings in Double A. He returned to New Britain last year and went 1-10, 4.81 in 86 innings. After watching him get smacked around in that game, I don't hold much optimism for him. but Ron Gardenhire apparently really wants him on the roster. “I wish somebody would step up and earn a job. Nobody’s really doing that, all these guys that are in competition. (Aaron) Hicks hasn’t been anything special this spring. Neither has (Alex) Presley. There’s your centerfield battle. ... Nobody’s really stepped up to try to earn the spots. That’s a bad feeling when you’re looking at giving spots away." It wasn't just the center fielders Antony was griping about. It was the guys going for the fifth starters job (although, frankly, he really has no reason to complain about Sam Deduno or Kyle Gibson). It was the guys seeking the utility infielder job (Eduardo Escobar, Jason Bartlett and Doug Bernier). It was Jason Kubel, brought in for the DH job. I am not alone, I know, in responding: What did you expect? The Twins put their resources this winter into adding pitchers. The only certain change they made to their lineup was replacing Justin Morneau with Kurt Suzuki. Even the low wattage Morneau we've seen since his concussions figures to be a better hitter than Suzuki. And that's it. The rest of the "upgrades" amount to recycling Jasons (Bartlett and Kubel). The rest of the projected roster is the same bunch that finished near the bottom of the American League in runs scored. This lineup is going to struggle to score 600 runs, and that struggle was eminently predicable all winter. Bartlett is one for 27 in Grapefruit League play after finally getting a single Wednesday. Well, the man hasn't hit since 2009. He hadn't played since April 2012. Was Antony really expecting him to hit like vintage Derek Jeter this month? Presley's limitations as a player were manifest last September, when he played pretty much everyday after coming over in the Morneau trade. He's 28. He is what he is. Jason Kubel is 31, he hit .216 last season, and nobody has accused him of overdoing his conditioning work. He's hitting .080 this spring. Josh Willingham is 35, he hit .208 last year, and his skill set seldom ages well. And now, as March is dwindling, Antony and Ron Gardenhire find themselves with a roster featuring Joe Mauer, Oswaldo Arcia and a bunch of guys who should hit eighth or ninth if they belong in a major league lineup at all. And somehow they manage to sound surprised about that. What the devil did they expect? As I did a couple weeks ago, I am posting Monday's print column in full to widen its audience. In the abstract, long-term contracts for relief pitchers are bad bets for teams. Nobody seems to be too concerned about that rule of thumb when it comes to Glen Perkins’ new deal with the Twins. The contract, worth more than $21 million in guaranteed money, binds the closer to his hometown team through 2017 and includes a team option for 2018. It replaces the two years he had left on his contract and represents some $14 million in new money for the 31-year-old. This, I suspect, will prove to be a better wager for Perkins than for the Twins. The theoretical risk for Perkins is that he won’t get to test the free agent market in two years. It’s only a theoretical risk because there’s no guarantee that he’ll remain healthy and effective over those two years — and because there may not be a hot market for relief pitchers when the time comes. The risk for the Twins? They’ve just invested in the proposition that Perkins will be their relief ace for the next four to five years. Know how many current closers have held the gig for the same team more than two years? One, Craig Kimbrel of Atlanta. Know how many current AL closers are signed beyond 2014? Four, counting Perkins, and the other three (Joe Nathan of Detroit, Fernando Rodney of Seattle and Grant Balfour of Tampa Bay) just signed two-year deals as free agents. The last time the Twins signed a closer to a four-year deal, it was Nathan, whose injury and subsequent Tommy John surgery erased one of those seasons and badly marred another. True, Nathan’s deal was more than twice as hefty as Perkins’ — $47 million for Nathan, $21 million for Perkins. The “average annual value” of Perkins’ contract is just under $5.6 million. The Twins won’t be eager to eat that sum, but it wouldn’t cripple their budget if it comes to that. The Perkins extension is a case of the Twins swimming against the current. The trend around baseball — and particularly among the stat savvy teams — is to avoid making heavy commitments to specific relievers. Only two relief pitchers have more guaranteed money coming their way now than Perkins does: Kimbrel and Jonathan Paplebon of the Phillies, and the enthusiasm in Philadelphia over the Paplebon contract has faded sharply over the two years he’s been there. The St. Louis Cardinals went through three closers last year — and went to the World Series, where they lost to the Red Sox — who also went through three closers. Tampa Bay habitually dives into the bargain bin for a closer almost every year. Billy Beane in Oakland made a practice of minting new closers and peddling them off to teams who overvalued the save statistic. So the Perkins extension has this unintended benefit to the Twins: They won’t be tempted to trade for a closer for at least four years. Assuming, of course, that Perkins is capable of keeping the job that entire time. What to do with Vance Worley? Vance Worley didn't make it out of the third inning Tuesday night against Tampa Bay. Eight outs, 11 hits allowed, seven runs and not a single swing-and-miss. He was, sorry to say, in midseason 2013 form, which is to say he was awful. There were four major candidates for the fifth starter job when camp opened, and all four are still around: Sam Deduno, Scott Diamond, Kyle Gibson and Worley. Deduno, Diamond and Worley are out of options and would have to clear waivers for the Twins to send him to the minors. Personal opinion, Twins should put Worley on waivers right after he's done. Should pass through waivers. Would like to keep him. The problem is: If they keep him, what will they do with him? Assume that the Twins do get Worley through waivers. Further assume that they option out Gibson and either keep both Deduno and Diamond or lose the loser of the fifth starter competition on waivers. The Triple A rotation would figure to start with Alex Meyer, Gibson and Trevor May. Also on hand would be lefties Sean Gilmartin (a 2011 first round pick by Atlanta, acquired in the Ryan Doumit trade); Kris Johnson (who arrived in a followup adjustment to the Justin Morneau trade); Logan Darnell (6th round pick in 2010, spent a good chunk of 2013 in the Triple A rotation); and Brooks Raley (picked up from the Cubs just before camp, spent 2013 starting in Triple A or relieving in the majors). I would rather work any two of the lefties in the Triple A rotation than Worley. I just don't see much upside to the "Vanimal." this season. If it happens, it will happen late in the season. The Detroit Tigers started their offseason infield makeover in the middle of last season. With shortstop Jhonny Peralta facing a 50-game suspension, Tigers GM Dave Dombrowski engineered a three-team swap that brought sweet-fielding Jose Iglesias to the Motor City. I don't know that Iglesias is as good as Peralta overall. Peralta is a much better hitter; Iglesias has superior range afield (and is probably more erratic). Iglesias is considerably younger and definitely cheaper. Peralta is gone now, having signed with St. Louis as a free agent (a signing that I find curious, as the Cardinals front office is as savvy as any; they paid up for a small-range offensive shortstop with one PED strike against him). And now Iglesias is gone, destined for the disabled list with shin fractures in both legs. Rumors upon rumors have resulted from that fact, starting with the notion, accuracy unknown, that Iglesias will miss the entire season (or most of it). The Tigers aren't saying much for the record beyond that the player is to see a specialist today, and Iglesias said this week he expects to play at some point. But since an offseason of rest didn't heal the fractures, out for the year seems plausible. The prospect of this potential powerhouse entering the season patching the position with a plethora of utility men is unlikely. Mike Illich has spent a fortune chasing his World Series dreams, and something will happen soon. 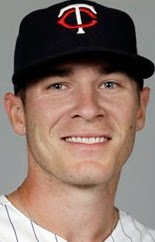 The widespread expectation is that Stephen Drew will land in Detroit. The free agent shortstop is a Scott Boras client, and Illich-Dombrowski have done considerable business with Boras. But Dombrowski, aware of the deteriorating status of his farm system, is probably reluctant to part with a first-round pick for a one-season rental, and Drew and Boras have indicated a reluctance to do a one-year deal anyway. And Iglesias remains prominent in the Tigers' longer-range plans. Presumably Dombrowski could sign Drew to a multi-year deal and then trade him when Iglesias is healthy, much as he flipped Prince Fielder after two years. But that plan assumes there's a market for Drew down the road, and there hasn't been one so far this winter. If not Drew, then what? A trade? The Seattle Mariners, having signed Robinson Cano, are believed to be shopping infielder Nick Franklin. But there's doubts that Franklin can handle shortstop. Jimmy Rollins, the Phillies veteran, has rather emphatically said he would reject a trade (he has that right as a 10-and-5 player), at least until he's passed Mick Schmidt as the franchise's all-time hits leader (he's 60 behind the Hall of Famer). Another, more realistic possibility, has the Tigers trading for one of the two non-established shortstops now competing for the job with the Arizona Diamondbacks, Chris Owings and Didi Gregorius. An Arizona deal is my guess. But I never figured the Tigers would react to the 2012 injury to Victor Martinez by signing Fielder either. All good things must end, and by the time this posts my wife and I should (Delta and the weather permitting) be wheels up and on the way back to Minnesota. I plan some more posts out of this journey, with a bit more emphasis on the photos. That will await more time with the 200-plus photos we took. Among the coming commentary: My take on the continuing renovation project at Hammond Stadium and the Twins complex and some chatter about what I saw on the minor league fields over the course of three mornings. But first, packing and the flight. And a return to the real job. a minor league game Sunday morning. The Twins cut eight more players Sunday morning, most prominently shortstop prospect Danny Santana. Santana muffed another throw Saturday in the game against the Mets; his inconsistency on the routine play is probably THE issue for him. Later Sunday morning, incumbent shortstop Pedro Florimon played most of a game between the Triple A and Double A squads. I showed up at that field just in time to see Florimon rip a triple down the right field line off B.J. Hermsen. I also saw Florimon strike out the next time up against Hermsen. I didn't see him called upon to make a play in the field. Word later Sunday had Florimon scheduled to play in tonight's major league exhibition. Florimon was one reason Ron Gardenhire was up in the tower watching the action. Another was Aaron Hicks, who was hitting (but not playing in the field) for the Double A team. I saw Hicks homer off Yohan Pino -- left-handed, Hicks' weaker side -- at which point major league hitting coach Tom Brunansky stuck his head in the dugout and called him out of the game. A few minutes later, both Hicks and Florimon were riding a golf cart to the main stadium. With non-roster guys Darin Mastroianni and Jermaine Mitchell sent down in the morning cuts, the center field job is down to Hicks and Alex Presley. Presley started Sunday's game against the Miami Marlins. He singled in his first at-bat and laer reached on an error. After the error, he tried to steal second. And, for the second time this spring, Presley beat the throw but overslid the base. He's 0-for-3 as a base stealer this spring. Hicks later replaced Presley in the game and doubled (right-handed, and with help from the Miami left fielder) in his only at-bat. If I had to guess right now, I'd say Hicks is the likely center fielder to open the season. Just to update my obsession with the notion of Jason Bartlett making the roster: He entered the game late at second base. He came up after Hicks' double in the bottom of the eighth. The lefty pitching for Miami fell behind 2-0. Ahead in the count. With the platoon advantage. Against a minor leaguer with 18 MLB innings to his credit. 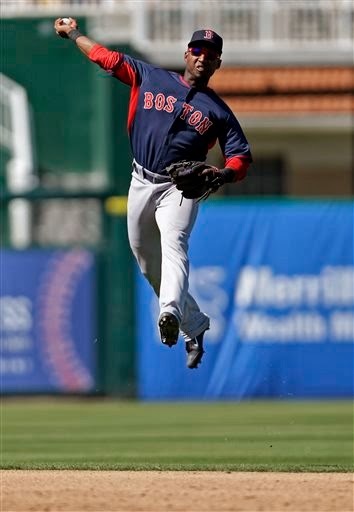 This was a prime shot for Bartlett to break his Grapefruit League 0-fer, right? Uh, no. He swung at the 0-2 and hit a weak foul to the first base side. He did, ultimately, draw a walk; he is now 0-for-23 with two walks, which works out to an on-base percentage of .080. Things figure to come to a head pretty quickly. Bartlett is said to have a March 25 opt-out; if he's not on the roster by then, he can declare free agency. The Twins should call that bluff; this is getting ridiculous. Deolis Guerra fires a pitch in the ninth inning Sunday. Saturday the Twins played on the other side of Florida (against the Mets); for my wife and me, it was Sanibel Day. No baseball; we spent the day on the islands of Sanibel and Captiva. The Marlins will be the visitors for one of the upcoming games I see in Fort Myers. I do not expect to see Giancarlo Stanton or Jarrod Saltalamacchia, the two established position players on the Miami roster. As it happened, the bulk of the Marlins' "names" were on a junket with the Yankees to Panama in some sort of Mariano Rivera tribute tour. 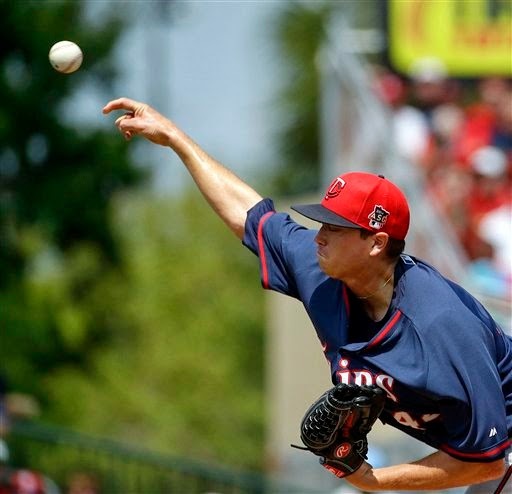 Former Twins pitcher Kevin Slowey started the Fort Myers game for Miami and went five innings, allowing two runs. Slowey spent last year with the Marlins and did fairly well, but was moved out of the rotation in midseason and later shut down after just 92 innings. He re-signed with them, but as a minor leaguer with the proverbial invite. I'd still love to see him make the Twins look foolish for running him off, but that seems unlikely. For the Twins, it was Ricky Nolasco for five innings of baserunners, ground balls and two runs. The Twins turned two double plays behind him (keystone combo of Eduardo Escobar at short and Brian Dozier at second). After Nolasco came Caleb Thielbar, Glen Perkins and Jared Burton, each of whom mowed through the Marlins lineup. Then came the guy I was most curious to see, Deolis Guerra. 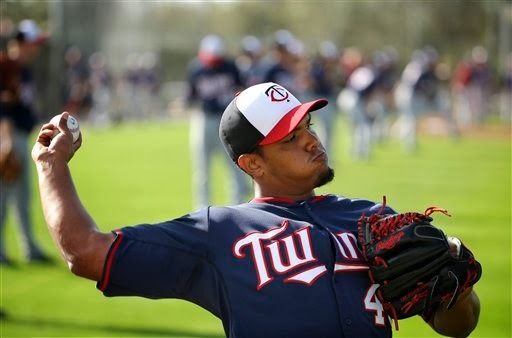 Guerra is the last piece of the Johan Santana trade left with the Twins. 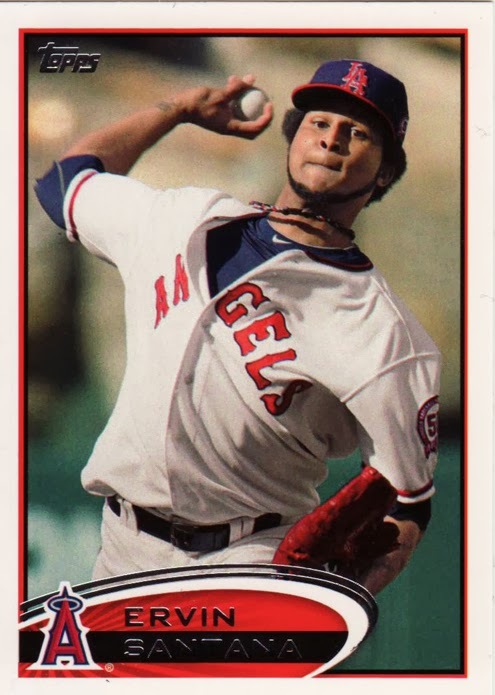 A big right-hander, he missed most of last year after a blood clot was found in his right shoulder while he was pitching for his native Venezuela in the World Baseball Classic. Like Slowey, he's a non-roster guy. Guerra's changeup has been touted in the past, and he used it quite a bit in the ninth inning. Fastballs were generally in the low 90s, topping out (this according to the stadium scoreboard) at 93. His change was in the upper 70s, and he struck out two Marlins with it. Guerra offers the same style of pitching as Burton. It comes at a lower price. I suggested last week that the Twins might seek to move Burton to make room for Guerra. What I saw Sunday certainly did not discourage that notion. This photo gets the nod because I was there and thought it a good play on a difficult chance, but I didn't have the angle on it that the photographer did. The second baseman had to go behind the bag to field the ball, and instead of planting his foot to make the throw, he used the Derek Jeter-style jump throw. With, it appears, serious hops. But the contrast with the Twins is illuminating. The Twins have a similar young guy-veteran competition for their utility infielder job too. Only their veteran is a 34-year-old who was out of baseball last season, Jason Bartlett. Herrera isn't a great player by any means; he didn't start for the Rockies, and he isn't going to start for the Red Sox. But it's easier to take him seriously as a major league player in 2014 than Bartlett. It was a couple hours before game time on Thursday, and the Twins infielders were leaving the little "Tom Kelly Field," passing between the barricades on their way back inside. A voice called out: "Welcome back, Jason!" Jason Bartlett -- the Twins regular shortstop in 2006-7 who was then dealt away in the ill-fated Delmon Young trade -- stopped, eyed the fans lining the railings, and walked over to a boy, to whom he handed his bat. 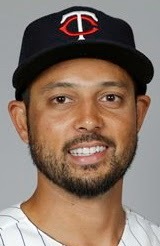 Since leaving the Twins, Bartlett has been an All-Star, played in a World Series, and been out of the game completely. Now he's trying, at age 34, to make that call of "welcome back" a reality. The odds are against him. He started Friday's game at Hammond Stadium at shortstop. One hard smash handcuffed him, although he did block the ball and got the out. At the plate, he flew out twice to left field, making him 0-for-19 in "official" Grapefruit League play. Bartlett spent Thursday afternoon playing around the outfield and leading off every inning in a minor league game. This effort was of sufficient interest to Ron Gardenhire that he skipped the early innings of the major league game to see Bartlett. 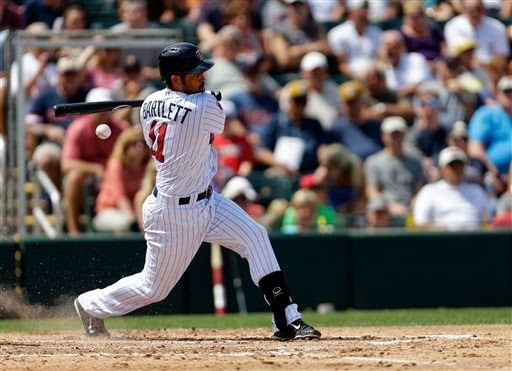 Gardenhire cast Bartlett's performance in a positive light -- he hit three balls hard -- and the consensus of the press seems to be that the manager really wants to have Bartlett on his roster as a utility guy. Gardy is a powerful ally to have in a roster fight, but even he doesn't see Bartlett as a legit shortstop contender. And at some point, Bartlett has to hit. Pedro Florimon flew out to LF in 1st AB in Ft. Myers game. Florimon fielded a ground ball but threw low to 1B for an error. Florimon strikes out looking for his second at bat..
One-hopper to pitcher in Florimon's third at bat in 3 innings. OK, not the best of outings for Florimon. And, again, that's the kind of thing that grates on a manager. Makeable plays that aren't made keep shortstops in the minors. a return to the Twins. If Thursday's game featured legitimate lineups (and it did) and a packed house (and it did), Friday's was something else again. Baltimore had no assured starters in its lineup, although the Orioles did bring a legitimate set of pitchers. And there were plenty of open seats in Hammond Stadium. The Twins had a split squad, with one set playing the Yankees in Tampa (and winning that one 7-3). The final outcome in my game was a 2-2 tie. Brandon Waring, the former Oriole farmhand of whom I wrote in my Day 1 recap, bopped a two-out homer in the bottom of the ninth off Troy Patton to even the score. But when Chris Parmelee flew out to end the ninth, the game ended. Presumably the Orioles were out of pitchers, or perhaps the umpires decided almost three hours of lethargic baseball was enough. Which it was. Mike Pelfrey starts are simply difficult to sit though. He exceeded 50 pitches in the first two innings and didn't make it through the fourth. He was followed by most of the veteran late-inning options in the Twins 'pen -- Brian Duensing (who allowed a homer in his 1.2 innings); Glen Perkins (who fanned two in a 1-2-3 inning and then signed a big contract extension); and Jared Burton. 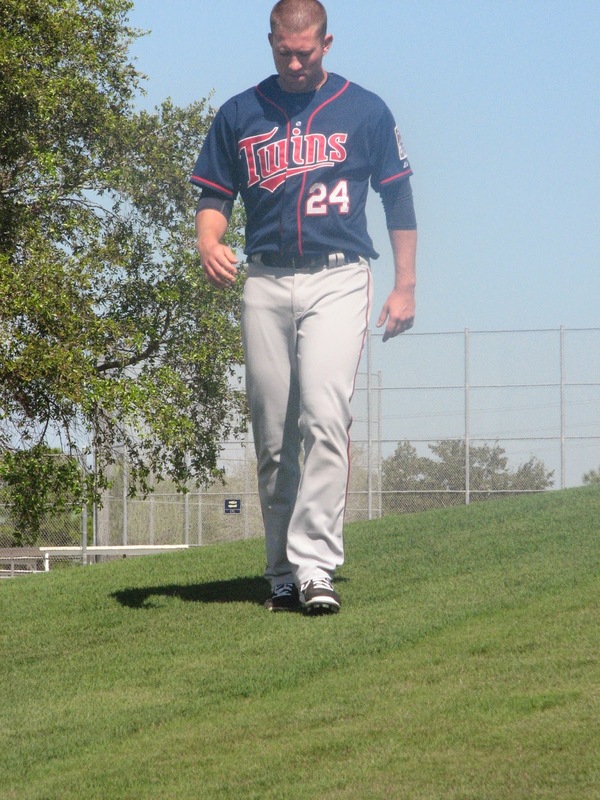 And then came Matt Guerrier, once a mainstay in the Twins bullpen and now a nonroster guy rehabbing from arm surgery. Friday was his exhibition debut for 2014. On the surface, it went well; Guerrier struck out two men and got his third on a weak grounder to second. On the other hand, I kept an eye on the scoreboard radar gun readings, and he didn't top 89. 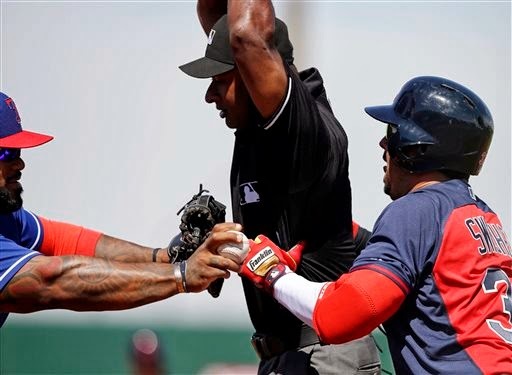 In comparison, Lester Oliveros, who worked the ninth (despite having been dispatched to the minor league complex on Sunday), repeatedly threw his fast balls at 93 and 94 mph and finished his inning with a reading of 96, which broke the hitter's bat. Guerrier was never a big velocity guy, but in his heyday he cracked 90 pretty frequently. This is not a slam on him -- as I said earlier, he's still in rehab mode -- but I'm going to say he's a bit short of being ready for the majors. High A and Double A. Incumbent shortstop Pedro Florimon might see some playing time before I return to Minnesota early next week, but for now he's sidelined. This has created playing time for other shortstops, including a shortstop of the past (Jason Bartlett) and the supposed shortstop of the future (Danny Santana). Santana played all nine innings Thursday against the Red Sox (the only player on either side who did), and we saw the good and the bad. Good: He doubled and walked. (The walk really startled me; Santana's minor league record says walking him takes some doing.) He also beat out what should have been an inning-ending double play. The Twins didn't take advantage of that, but it showcased his speed. Bad: He was prominent in a string of flawed infield plays, some of which were ruled errors and some of which were not. The Twins were charged with three errors Thursday -- one each for Santana, Trevor Plouffe and Joe Mauer -- and all four runs they allowed were officially unearned. Santana booted a grounder in the fifth inning that led to a pair of runs. In the third inning, he dropped a throw from catcher Kurt Suzuki on a stolen base; the umpire made the out call, then saw the ball on the ground and properly changed the call. Not an error. Then Santana just missed making a leaping catch of a Shane Victorino liner that drove home the base stealer. I won't say he should have caught the ball, but leather touched leather. Patrick Reusse is calling for Santana to get the shortstop job, comparing his defensive inconsistencies to those of Zoilo Versalles, the Twins shortstop for most of the 1960s and the league MVP in 1965. Watching Santana play short on Thursday, I can understand Ron Gardenhire's reluctance to go in that direction. Managers hate it when shortstops fail to make makeable plays. But there's a part of me that remembers being pleased when the Twins bit the bullet after the 1998 season, let Pat Meares go and committed to Cristian Guzman at shortstop. Guzman wasn't really ready for the majors, and he struggled for a while, particularly at the plate. But he was also clearly athletically superior to Meares. Florimon vs Santana echoes Meares vs. Guzman. Santana will make more mistakes than Florimon. But he will also hit better (no real challenge). And he has more room for growth. Florimon isn't going to get any better than he was last year. I now believe there's a better case to be made for Santana as the shortstop than I thought earlier this winter. But I suspect skipping him up from Double A is a call that would need Terry Ryan's involvement, especially if Gardenhire is wary of an inconsistent gloveman at the position, and that involvement isn't coming this month. I'm in Fort Myers for a few days to take in a little spring training and escape what I presume is the continuing melt from our harsh winter. The Twins pitching usage might contain a signal. Phil Hughes started and went three innings. The first two were very good, the third was ugly -- there were two errors, a play that should have been made but wasn't, a play that probably couldn't be made but almost was, and way too many pitches. Sam Deduno, the apparent front-runner for the fifth starter job, was also scheduled to work. But before he got the call, non-roster lefty Matt Hoffman worked two innings. The first was clean, the second was not: another infield error resulted in two runs. Unearned runs, but they still count as runs. This interests me because the Twins used Hoffman while the Red Sox still had their regulars in the game. They obviously wanted to see him against bona fide major league hitters. Duduno got his work in against the subs (three clean innings). My inference: The idea of replacing Brian Duensing with Hoffman may have legs. Jason Kubel looked a bit trimmer than I remember. He drew two walks Thursday, one of them against a lefty. Earlier in the week, he homered off a lefty, and a really good one (David Price). Kubel hadn't done much this spring before this week, and he probably needed to start showing something. I'm not trying to sell this as reason to believe in Kubel. There's a lot of reason to say he can't hit lefties enough to justify playing him against them -- like his entire career. But there are people in the Twins organization looking for reason to believe in him, and one in particular is the manager. Brandon Waring is a minor league vet in camp as a nonroster invitee. We were seated next to the assistant general manager of the Bowie Baysox, the Double A affiliate of the Baltimore Orioles, and he spoke highly of Waring, who he described as a decent third baseman, can play first or (in a pinch) an outfield corner, good power, doesn't hit for average. I theorize the Twins signed Waring because they figured Miguel Sano was going to need surgery and they needed the third base help for the high minors. That's how it worked out. 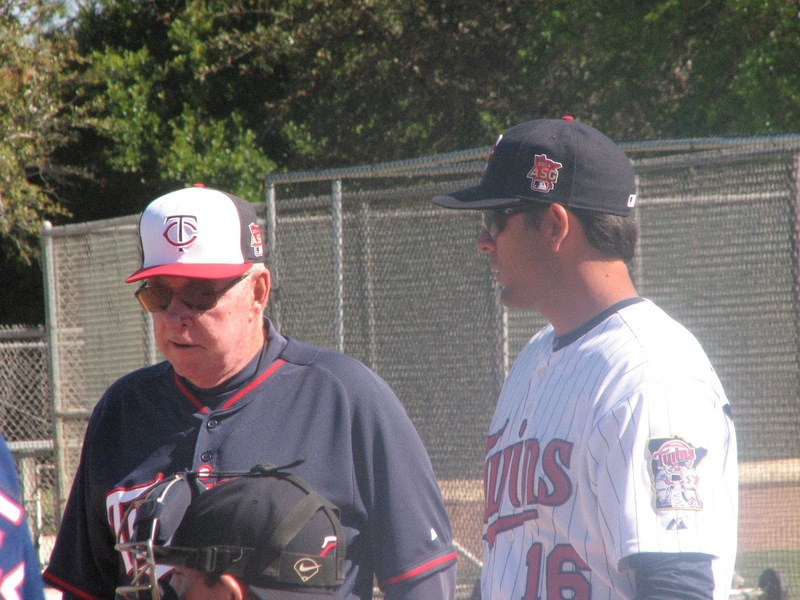 With most (but not all) the intriguing prospects relegated to the minor league complex, the Twins major league camp now gets down to the business of winnowing down to the 25-man roster that will open the season. There are still 48 players in camp, almost enough to field two full teams. And some of them aren't fighting for jobs. Comment: In my ideal world, Suzuki would be a heavy-use No. 2 — 60 to 80 games— behind Josmil Pinto. That's clearly not the current plan, and I'm starting to wonder if Pinto is durable enough to be a regular catcher anyway. Comment: Florimon's appendectomy has held him back, but Ron Gardenhire has said Florimon's his shortstop. He's practicing now but hasn't appeared in any Grapefruit League games. Comment: The Twins aren't publicly conceding a job to Arcia, but it would be rank silliness to send him back to the minors in order to feed at-bats to the likes of Jason Kubel or Chris Parmelee. Presley may or may not be the regular center fielder -- I think the Twins would prefer to have Aaron Hicks get the job -- but if he's not a regular, he'll be a bench guy. Rotation: Ricky Nolasco, Phil Hughes, Kevin Correa, Mike Pelfrey. Comment: These four are to get at least $5.5 million each this year. They're in. Comment: Between contract status and effectiveness, they're in. The Twins may try to trade one or two of them to make room for younger relievers, but they're not going to release any of them. That's 17 locks. Assuming a 12-man pitching staff (five starters), that leaves room for five position players, one starter and two relievers. And that's what the remaining 31 players in camp are competing for the next two-plus weeks. one of the first bullpen reinforcements called upon. It is a basic rule of thumb: Relief pitchers are fungible. Meaning that they are inconsistent, injury prone and readily replaceable, and that as a result teams are well advised to avoid multi-year or expensive contracts with bullpenners. There are exceptions -- Mariano Rivera, for one -- but the rule is valid. The 2013 Twins had eight relief pitchers make at least 48 appearances, and all but one of those eight (Caleb Thielbar) worked at least 60 innings. One of those eight, Josh Roenicke, is gone, and the Twins could (but probably won't) open the coming season with the returning seven. The two at the most risk of losing their jobs figure to be Thielbar and Pressly. Each has options, each is near minimum pay, and each is near the bottom of the totem pole. Meanwhile, the Twins have a stash of out-of-options rotation candidates who might be carried as relief depth. And they have some interesting alternatives among pure bullpenners as well, even after the demotions Sunday of the likes of hard-throwing Lester Oliveros and lefty Edgar Ibarra (whose health issues kept him out of exhibition play). Burton and Fien have the jobs as the top righties in the pen, but Michael Tonkin might be better than either, and I believe the Twins' patience with Deolis Guerra will someday be rewarded. Then there's the veteran Matt Guerrier, who is reportedly throwing well in his post-surgical rehab and is scheduled to make his exhibition debut this week, and Matt Hoffman, a non-roster lefty who appears to have learned to use his slider as a strikeout weapon. And suddenly the Twins have a shadow pen of sorts. Guerra and his changeup mirrors Burton and his off-speed weapon; the high-velocity Tonkin matches the fast-balling Fien; starting candidate Scott Diamond pairs with former starter Duensing; Guerrier has a history in the long relief/middle innings role; Hoffman appears to be a viable lefty specialist. Plus Oliveros, who was praised by assistant general manager Rob Antony even as he was being shipped out. might not be a step back from the current alignment. Patrick Reusse said Tuesday on the radio that he hears the Twins would like to move Burton and/or Duensing. That makes a good amount of sense to me. Ervin Santana remains a free agent, in large part — perhaps entirely — because of the draft pick price attached to him. He's not alone — Stephen Drew and Kennys Morales are in the same uncomfortable boat — but unlike the two position players (both clients of Scott Boras), Santana's taken some action, useful or otherwise: He canned his agent, a guy with the unlikely name of Bean Stringfellow, last week, and soon there were rumors of teams sniffing around him. One of those teams is the Twins, who were reported during the weekend to have offered him a three-year deal. This notion doesn't do much for me. The Twins already signed three veteran starters to bolster the rotation; adding a fourth isn't solving a current problem. More than another veteran starter, this team needs an infielder who can get on base (besides the first baseman) and a corner outfielder who can catch the ball. Fortunately, Santana at this point seems intent on a one-year deal with a good offensive team (the idea being to fatten his record and try the market again next winter). The Twins do not meet that good offense criteria, and are unlikely to surrender a second-round pick for one year from Santana. Other teams reportedly linked to Santana: Toronto, Baltimore and, after a couple of injuries in recent days to their starting pitching, Atlanta. sent to the minor league camp on Sunday. The Twins on Sunday optioned out or reassigned 16 players in their first round of cuts. Last year the first set of cuts involved five players, four of whom were injured anyway, so those cuts were barely noticed. Among the 16 moving down the street to the minor league setup are Byron Buxton and Alex Meyer. Miguel Sano too, although that's just a paper move; he's to have his Tommy John surgery Wednesday. The Twins now have 48 players in major league camp, and presumably part of the purpose in cutting so many early on is to free up more at-bats and innings for the players who are going to be on the opening roster -- or who are competing for that roster. Ron Gardenhire was playing Buxton a lot this past week on the basis that "the clock is ticking" on the prospect. Now that playing time will go to the likes of Aaron Hicks and Alex Presley. Neither Buxton or Meyer had a realistic chance at the Opening Day roster. Nor did any of the other 14. In that sense, their demotions were logical, even necessary. Still, speaking as one who has tickets for three exhibition games in the next week, I have to say: I'd much rather see the just-demoted Buxton or Max Kepler or Jorge Polanco in those games than Presley, Jason Kubel or Jason Bartlett. One set represents the unknown but presumably bright future; the other set represents the fading past and present mediocrity. The Monday print column discusses the issue of spring training lineups and touches on the ethics of charging nearly regular-season prices for games with lineups that are not of regular-season quality. In the case of the Twins, I don't think the customers are being ripped off when the lineup is heavy on prospects and light on regulars. The Twins' kids are more interesting. Early March, and I'm already fully expecting another Twins team that's not only bad but boring. That tone has now been set. a real estate ad on an outfield fence in Jupiter, Fla. I might not have selected this photo had it been somebody other than Joe Benson, once a highly-regarded Twins prospect. That it is Benson gives me a reason to talk about him. Benson's in the Miami Marlins' camp as a non-roster invitee. My take on the Marlins at this point is that it's a franchise one signs up with when there are no other alternatives. To be fair, Benson (and his agent) may have figured the outfield situation with the Marlins is fluid enough for him to have a shot at making the roster. There's Giancarlo Stanton, who's established as a top flight power hitter; there's Christian Yelich, who's a well-regarded prospect (better regarded than Benson was at the same age); and not a heck of a lot else to get excited about. And given that Stanton is starting to get expensive, and has been critical of Marlins management, he might not be around all year. But Benson's career is in trouble. The Twins cut him loose last summer with a slash line of .192/.256/.285 in Triple A. The Rangers picked him up and sent him to Double A; .205/.293/.394. The Rangers let him walk this winter and he signed with the Marlins. He's 26 now; time is slipping from him. His first 11 spring training plate appearances with the Fish: 0-for-11. Small sample size, to be sure, but still ... that's not a good impression he's making. Benson appears to be an example of the difference between an athlete, which he definitely is, and a major league baseball player. hang around a big league club's spring training complex. I'm a sucker for a dog rescue story, so of course I love the story of Hank and the Milwaukee Brewers. 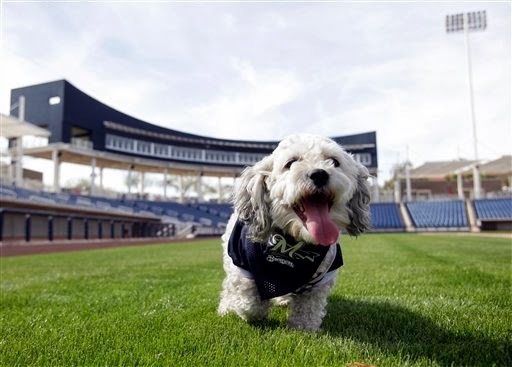 When the Brewers opened spring training in mid February, a bedraggled stray started hanging around the complex in Maryvale, Ariz. A stadium worker took him to a vet, who determined that he had at some point been hit by a car. He quickly became an unofficial mascot, hanging out at the park wearing a Brewers bandana or dog shirt -- or a hot dog outfit to take part in the sausage race. He's become the star of camp. Today Hank the Ballpark Dog (named in honor of Henry Aaron) is to be the center of a Pet Adoption Day at the Brewers' game with Kansas City. The Arizona Humane Society will have animals available for adoption on site, and Hank will be on hand to take photos with those who donate to the organization. Hank's not available for adoption himself. The Brewers aren't saying who, but Hank has a forever home now (but still doing sleepovers with players or other team personnel). And there's a "rumor" that he'll take part in the sausage race at Miller Park on opening day. 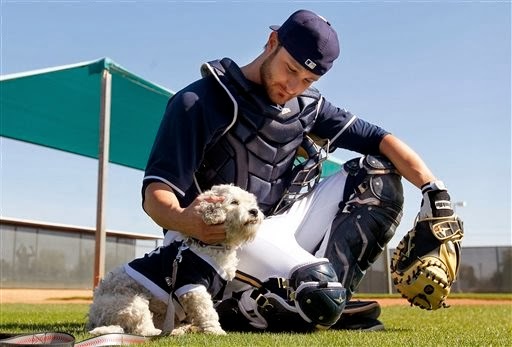 Hank confers with catcher Jonathan Lucroy. in Cooperstown for his contributions to the game. 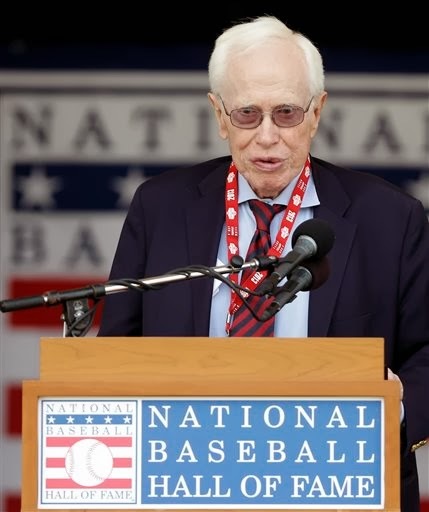 It is almost impossible to imagine baseball today without Dr. Frank Jobe, the orthopedic surgeon who invented what is popularly known as Tommy John surgery. John was only the first baseball player to have an elbow ligament replaced. Only the first. There have been hundreds since that pioneering surgery. Soon Miguel Sano will join the crowd. John Smoltz. Francisco Liriano. Joe Nathan. Adam Wainwright. Chris Carpenter. Brian Wilson. Tim Hudson. Billy Wagner. Stephen Strasburg. Kerry Wood. Anibel Sanchez. Jordan Zimmermann. A.J. Burnett. All, and dozens more, have had the surgery. The Los Angeles Dodgers, with whom Jobe was associated for 50 years, announced Thursday that Jobe died. He was 88. I doubt there's a team without somebody who's had Tommy John surgery. (The Twins, for example, have Brian Duensing, Sam Deduno and Mike Pelfrey.) Pitchers have been blowing out their elbows for generations; until Jobe came up with the idea of taking a tendon from a different part of the body, attaching it to the bones and essentially training it to act as a ligament, nobody had a solution. Today Tommy John surgery is almost routine, with a reported 95 percent success rate. Yes, it's a long and grueling rehab process, at least for pitchers. But it's far better than what they had before Jobe got creative.